Why should conservative parents send their kids to Lake County Schools that follow David Coleman's Common Core? The architect of Common Core during the Obama years was David Coleman, a person with no educational background. He is now head of the College Board which produces the SAT college entrance exams and also runs the AP programs. Agenda item 10.08 of the Jan. 14th, 2019 LCSD Board agenda (tomorrow) describes funding for two new "Pre-AP" courses and payments to the College Board. If you search on "David Coleman and Common Core" you can find many videos and articles about how Coleman, with support from Hillary Clinton and Obama, pushed through Common Core standards. As you know, Florida and LCSD adopted those standards, which were re-branded as the Florida Standards, but still are 98% Common Core. Forbes Magazine: "How Common Core Testing Damaged English Classes"
Here is a transcript of a 2011 speech made by Coleman one year before he became head of the College Board. In it, he described the priority needed to control education TESTS because teachers always "teach to the test". HERE is a link to the 70 minute speech video. An overview of how David Coleman went to Bill Gates and got the funding for a BUSINESS reason to form Common Core to enrich businesses and Microsoft. As many Lake Countians know, the Lake County Schools prior Administration took millions in Bill Gates grants to implement some of the methods like IPL. Those grants have all expired now, but some damage was done. Here is my older factsheet on Common Core dangers. 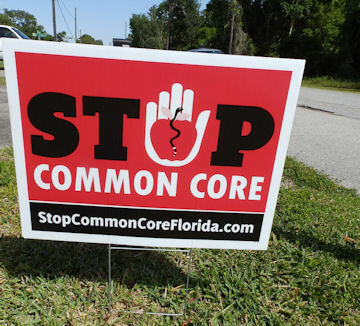 Additionally, keep in mind that new Governor Ron DeSantis came out saying that Common Core is not acceptable and he replaced the Florida Education Commissioner with anti-Common Core former House Speaker Richard Corcoran. Why should parents send their kids to such a school system like LCSD that still provides Common Core focused content and methods, including SAT and AP activities and programs? That is what the LCSD School Board needs to discuss, and ways to stop using SAT, AP courses and other David Coleman liberal/biased Common Core content.